Men shaped liked cannonballs, bars full of people who do not drink, firework spitting bulls and storms that wreck entire villages. These are the delights of the Mataraña region of Spain. Lost and forgotten in the Portals of Beceite almost as distant from the sea as it is from Barcelona, this place is as far from "fast food land" as you can get. Foreign tourists rarely visit here unless they are hopelessly lost. English is not spoken and, in many cases, neither is Spanish. Imagine a place where a chat takes clear priority over a sale, where shops provide seating so that customers can gossip whilst they wait to be served. Imagine a bar where the owners refuse to allow you to pay for a drink, where the locals greet you like long lost friends and the mayor constantly flits in and out. This is the village of La Fresneda, a little jewel tumbling down a pair of ruin capped hills. A place that sleeps for eleven months of the year then awakes for the biggest party that you have ever seen. A village that is wired for sound so that the ageing residents can be told what is happening in the square. A place where little old men still struggle up the hills weighed down by large bundles of wood strapped to their backs. The Mataraña area is named after the miserable river that trickles through it and resides in the region of Teruel, a place that, according to the Spanish, no one goes to and no one come from. Think of Lincolnshire just after the plague. It is a place of extremes where the long hot days of summer are replaced with terrible storms in the winter when the trickle of the Mataraña river becomes a raging torrent ripping up trees and roads as it races towards the west. This is a place where the word arid is forever on your lips, where only the hardiest trees and plants survive. And yet the main occupation is farming, the main crops being olives and almonds. 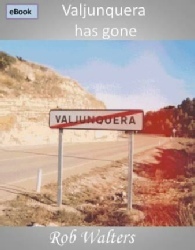 "Valjunquera has gone" is an introduction to a magically unspoiled area of Spain. It describes a locality that is about as far away from the Spanish images of sunny beaches, beautiful dark haired señoritas, bull fighting matadors and flamenco musicians as Barcelona is from Bangkok. This book is not a travel guide. It is meant to be read by people who may never go to Spain as well as those who might. It is amusing and interesting and is written from the viewpoint of a semi-resident Englishman who barely speaks Spanish or Catalan and who is there more or less by accident. It is a thoughtful and very personal account which makes many comparisons between life in rural Spain and life in modern day Britain. When published it could transform our secluded village into a tourist trap for visiting Britons. But I think not, the invasion of the Britons will continue to focus on the Costas leaving us, and the inhabitants of La Fresneda, to languish in one of the areas that globalisation has passed by.